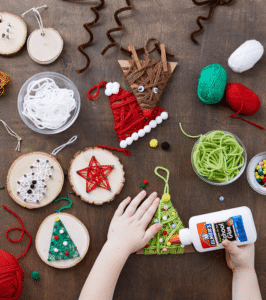 Whether you’re planning for DIY gift giving, or just looking for ways to keep little hands busy this season, fun and simple Christmas crafts are always a great option. We’ve scoured the internet to bring you 25 cute ideas you can do at home with your little ones. It’s a great way for them to be a part of all of the holiday festivities! 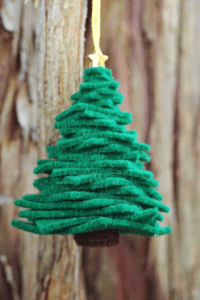 These adorable and simple 3D Felt Christmas Tree Ornaments from hello, Wonderful are a perfect start. With just five easy-to-find craft items, your kids can create an evergreen forest to hang wherever you choose. 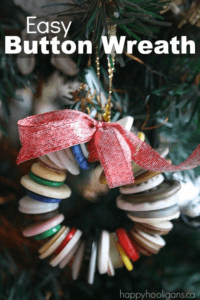 Sew on beads or add some glitter to “decorate” your trees as you see fit! Next up is the Button Wreath Ornament from Happy Hooligans. You know all those old buttons taking up room in the junk drawer or in your sewing kit? Why not repurpose them as fun Christmas ornaments? Add some string and a bit of ribbon to make a bow and you have a perfect craft for preschoolers. These are simple and fun to make, and will help little ones practice fine motor skills. You can even teach colors and counting while you’re crafting! Looking for a fun class gift or something your kids can give to all their friends? 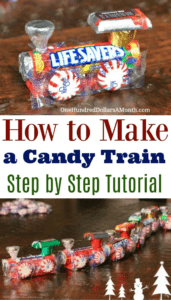 Why not make some of these cute Candy Trains from Mavis Butterfield? They’re inexpensive enough to fit into almost any budget, and kids love making them and eating them too. Be sure to make extras though, you never know when you might want a cute little gift to hand out! 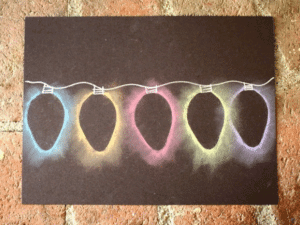 This Christmas Light Chalk Stencil Art from Buggy and Buddy is sort of like finger painting without the paint. Break out last summer’s sidewalk chalk, or head out to your local craft store for some fun colored chalk. Add some black construction paper, a silver sharpie, and some stiff paper like a cut up folder or cereal box and you have everything you need. It’s simple enough even the preschoolers can take part, but pretty enough when complete that older kids may want to get in on the fun too. Lots of kids crafts employ hand prints. They’re fun to make and a wonderful keepsake. 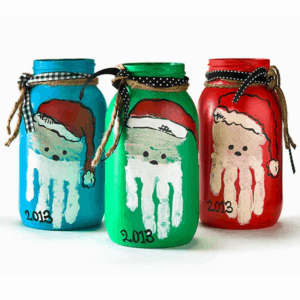 Years down the road, you can look back and say “Look how little your hands were!” These Christmas Santa Jars from A.C.Moore are a great example. Use them as vases, candy jars, or to store pencils and paint brushes at Christmas time. 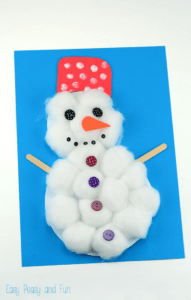 Let preschoolers create their own Christmas cards or decorate their bedroom walls with a Cotton Ball Snowman from Easy Peasy and Fun. You can go as simple or as creative as you like with the decorations, to create a personalized snowman for each kid! Because of the use of a hot glue gun, this one is best for older kids who won’t burn their fingers. 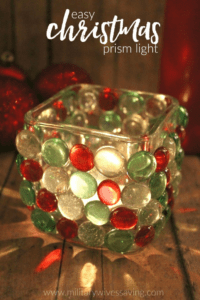 This Easy Christmas Prism Light from Military Wives Saving makes a beautiful candle holder to display in your home or give as a gift. Switch out the candle for a flickering LED for a flameless option. This classic craft has probably been around since your grandparents were little. These Easy Salt Dough Ornaments from The Imagination Tree are a fun craft that can get the whole family involved. For little ones, just stamp them out with cookie cutters and let them paint as they like. For older kids, they can add textural details or mold their own shapes. Even Mom and Dad can get in on the fun and create unique family ornaments to hang on the tree for years to come! You’ve painted with brushes. You’ve finger painted. You’ve probably even painted with sponges. But have you ever painted with forks? Turns out, it’s a perfect method for creating Christmas trees. See how in this Fork Painted Christmas Tree tutorial from The Pinterested Parent. Once your kids have created a tree, decorate it however you choose. You’ll have fun and festive one-of-a-kind artwork from your creative little one! 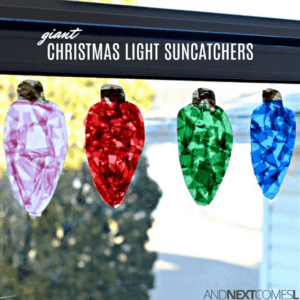 Decorate the windows in your kids rooms or the family kitchen with these Giant Christmas Light Suncatchers from And Next Comes L. They’re super simple to make, and add a stunning bit of color to the season. Plus, the kids will have a ball ripping up tissue paper, so they’re sure to love this craft as much as you will! There are at least a million window clings available at just about any craft store, but why not make your own? 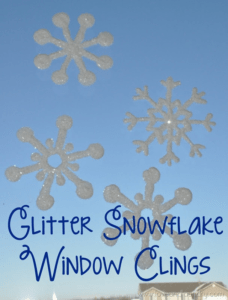 These Glitter Snowflake Window Clings from Love and Laundry will decorate your windows with a glittering and glistening blizzard in no time! This one’s probably best for older kids as it might be a bit messy for little ones. 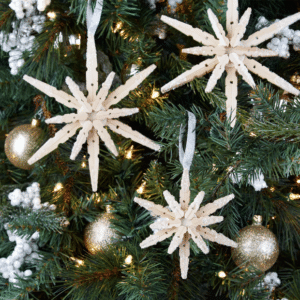 Create stunning wooden snowflakes with this Kids’ Clothespin Snowflake Ornament craft from Michaels. 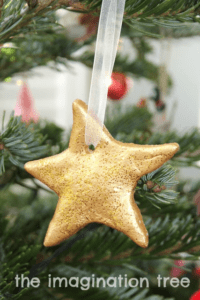 With just a few simple supplies, and a bit of glue and paint, you’ll have beautiful handmade ornaments to hang on the tree or decorate wrapped gifts. 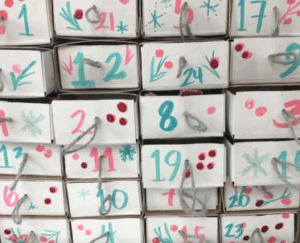 For a creative craft that will bring joy through the whole month, you’ve got to try this Matchbox Advent Calendar from CreativeBug. It’s simple to make in your child’s favorite colors, and you can tuck small candies or little toys in each “drawer” to reward them throughout the season. Perler beads are a fun creative toy for kids of all ages. 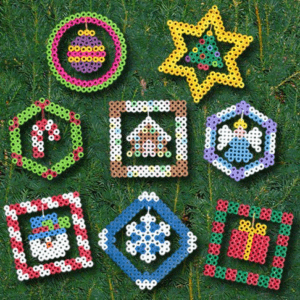 These fun and colorful Christmas Ornaments from Perler’s site make lovely package toppers or decorations for the tree. They’re a great way to teach fine motor skills and inspire creativity at the same time. And the dangling inner piece of each design gives them a fun, mobile effect. Follow the patterns exactly or get creative and make your own designs. The choice is yours! 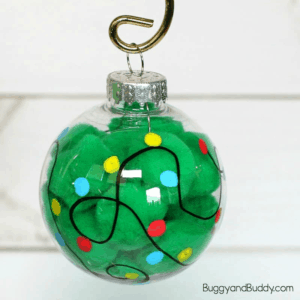 This Pompom Christmas Light Ornament from Buggy and Buddy is an easy creation that looks stunning. It’s pretty enough to display on even the most sophisticated tree, so make a few extras to give to neighbors and friends! It’s a fun treat for little ones to color in these Printable Nativity Cones from Kate Hadfield Designs. 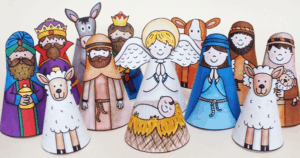 You can then use them to teach your child about the meaning of Christmas, and they can display their very own nativity scene in their bedroom or play area. Not into Nativity scenes? The same site has some super cute Christmas Cones too! Do your kids stay up late on Christmas eve hoping to catch a glimpse of flying reindeer and a jolly man in a red suit? 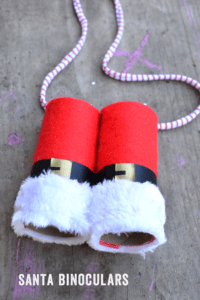 These Santa Binoculars from Meri Cherry are a fun way to encourage the wonder and curiosity of childhood. They’re also fun to take to a Christmas parade or tree lighting, or while viewing Christmas lights and decorations. Have family that lives far away? 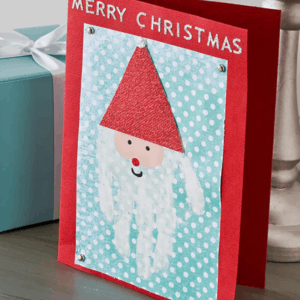 Why not create a Santa Handprint Card from A.C.Moore to send this holiday season? Grandma and Grandpa or Aunts and Uncles will see how big your little one is getting, and the whole family can add their greetings to the inside. For a lot of kids, this year is all about the slime. It’s surprisingly easy to create and comes in every color of the rainbow. 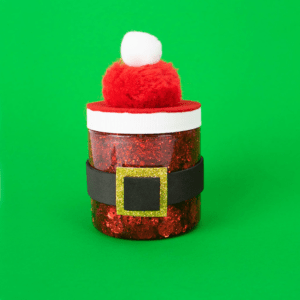 Why not let them create this Santa’s Belt Slime from Michaels to give to all of their friends this Christmas? 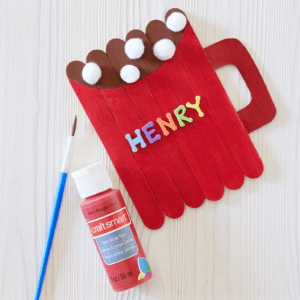 They’ll have a blast making it and their friends are sure to love this inexpensive and fun gift! This two-in-one craft is a great classroom gift or can be used to decorate packages. 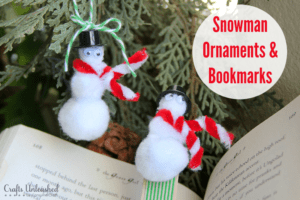 These Snowman Bookmarks & Ornaments from Consumer Crafts’ blog, Crafts Unleashed are simple to make and a lot of fun too! Let your little ones get creative, and decorate their snowmen in their own unique style! 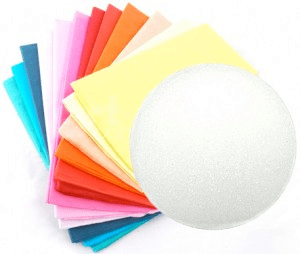 Your kids will have a blast ripping up tissue paper to create this Styrofoam Ball Christmas Ornament from Factory Direct Craft. Use Christmas colors, match your tree decor, or let them pick their favorite colors. Decorate your ball with glitter if you choose, or glue on sequins, buttons, pompoms, or anything else you like! This one is a craft at first, and then a fun activity! 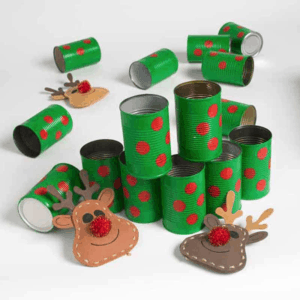 Create a Tin Can Alley Reindeer Game from A.C.Moore. It’s great fun to keep kids entertained during that long holiday break, or use it as a party game to keep the little ones busy during your big holiday bash. Either way, they’ll have as much fun making the game as they will playing with it! Let your kids create their own holiday decor with this simple Winter Wreath from A.C.Moore. 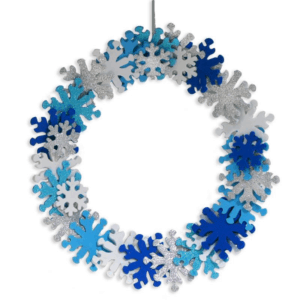 It’s made from brilliant and soft foam sticker snowflakes, so just about any age child can create their own with ease. These Yarn Wrapped Holiday Ornaments from Joann are a fun and festive way to add a personal touch to your tree. Or use them as package toppers to get the kids involved in the gift wrapping and giving tradition. The triangular Santa hats, Christmas trees, and reindeer are adorable and easy to make too! Pick your favorites, or create all 25 projects. Before you head out to the craft store of your choice, or even if you’ll be shopping for crafts online, be sure to check out our Crafts Coupons page. But most importantly, from all of us at Crafts Glossary, we wish you and your family a happy and fun Christmas season, full of wonder and special memories.